Skateboard straps are an essential for a boarder on the go. While many backpack varieties come readily-equipped with skateboard straps, you can easily transform a run of the mill model into a convenient, hands-free skateboard transportation system. Making external straps to hold your board is a quick and painless process that only requires inexpensive items. There are also makeshift ways of securing your board to your backpack without purchasing any materials or sewing a single stitch, so consider what will be most convenient for you before beginning. Wrap a piece of string or yarn around the middle of your skateboard, leaving a few inches of room for flexibility. Cut the string accordingly and then measure the length with a ruler; this will give you the measurements you'll need for your two hook-and-loop fastener straps. Lay your backpack out on a flat surface strap-side down. Place your skateboard on top of the backpack with the grip-side facing down and the trucks facing out at you. Adjust the board until it is centered on the backpack. Mark the places just above the bottom truck and just below the top truck with a piece of chalk. Remove the skateboard from the backpack and place your hook-and-loop fastener straps on top of the areas you marked with chalk. Sew the hooked sides of the straps face-up on the backpack with a needle and thread; leave the looped sides loose. Place the skateboard truck-side up, grip-side down on the backpack. Lift the loose, looped sides of the hook and loop fastener straps and bring them tightly across the board. Secure the looped portions to the hooked portions. For a no-sew option, slide the board horizontally through the backpack straps so that the smooth, non-gripped side of the deck will rest against your back. Carefully put your arms through the straps to keep the board in place and you're ready to go. 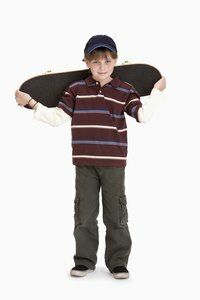 Many manufactured skateboard backpacks are specially designed with extra padding to reduce damage to the board in the case of accidental impact; if you're making your own strap attachments, consider adding a layer of padding inside your backpack to ensure your board stays intact in transit. A DIY tutorial to make a one of a kind full size backpack. Perfect for school aged children and for adults.